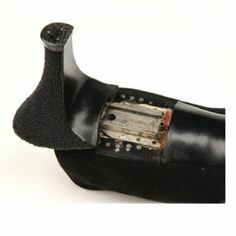 Manual S. Gutierrez Inventor | Detachable Shoe Heel 1930. While doing research on shoes from the 1930s, I stumbled upon this shoe patent for a detachable heel by Inventor Manual S. Gutierrez. It immediately caught my attention because recently two of my favorite fashion history blogs, The Historialist and Jonathan Walford’s Blog, had related posts on interchangeable heels. What I find interesting is that this patent precedes any of the shoes mentioned in their posts. When I think of the Detachable Heel the Famous I. Miller ad from 1954 comes to mind. It never really seemed like a good idea to me, but the novelty is definitely appealing. As Jonathan Walford mentions in his blog the design is still being reinvented. I would love to know more about Manual S. Gutierrez so stay tuned. I couldn’t find anything when I did a search, but he must exist somewhere. § 2 Responses to Manual S. Gutierrez Inventor | Detachable Shoe Heel 1930. OK – am I hallucinating/ Or are there tiny white things falling across the page like snow? « New | First Photo Challenge For The New Year, The Daily Post. 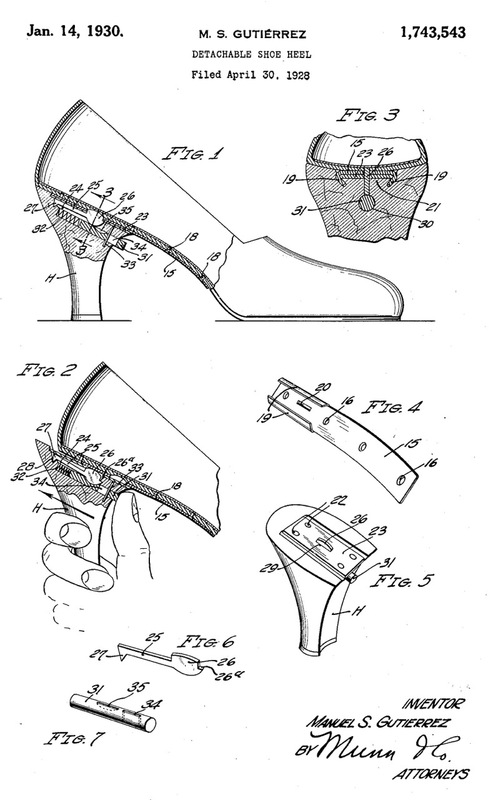 You are currently reading Manual S. Gutierrez Inventor | Detachable Shoe Heel 1930. at Women's Footwear in America.